Neil Jennings was one of the guests on alberta@noon (CBC Radio) last Tuesday. 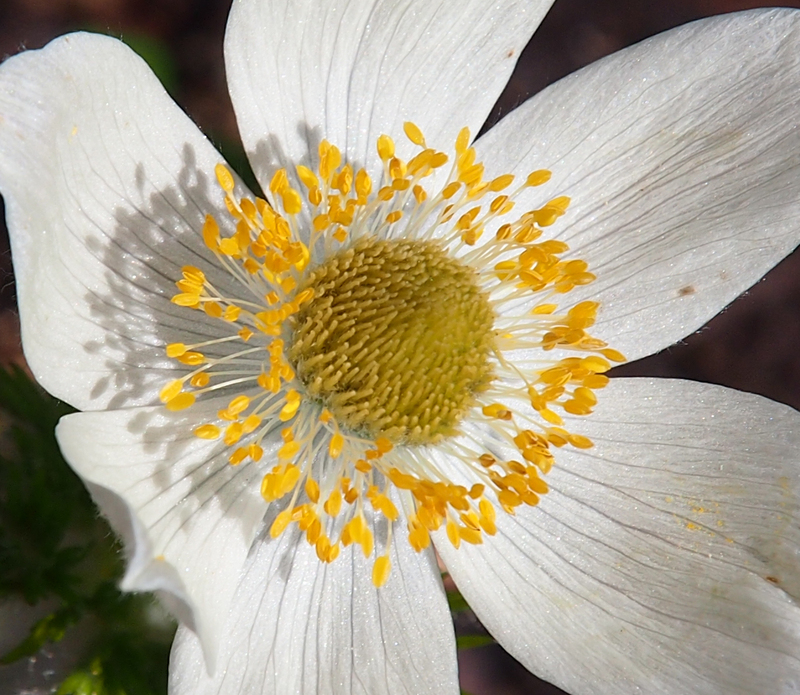 Fly fisherman, photographer and author of 7 books, Mr. Jennings is an expert on wildflowers. Since he was taking calls and emails from listeners, Mrs. GeoK dashed off a quick email with two wildflowers she’d photographed earlier in July but hadn’t been able to identify. Mr. Jennings helpfully identified both. Later in the show, he mentioned his plans to ride the bus up to Sunshine Meadows and hike over to Healy Pass on the weekend. 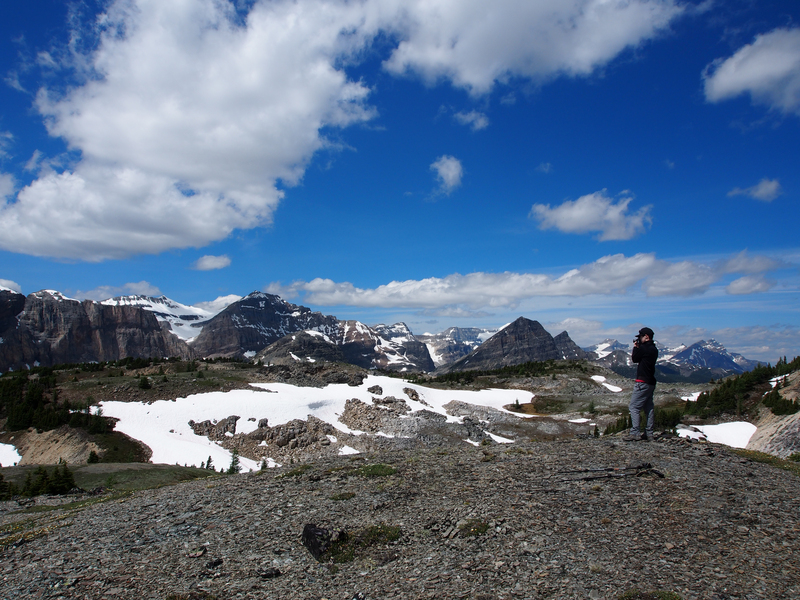 We last hiked to Healy Pass (via the Healy Creek trail) almost exactly one year ago. At the time, we agreed we’d like to visit this area again, perhaps via the Simpson Pass route or maybe in the fall to enjoy the golden larches. Mr. Jenning’s plans prompted us to look at the weather forecast for the balance of the week and then check for seats on the White Mountain Adventure’s shuttle bus (which can be booked online here). Thursday morning we headed to the Sunshine parking lot for a long day of hiking. We caught the 9 o’clock shuttle bus, which was about 15 minutes late leaving the parking lot on account of a few stragglers purchasing last-minute tickets. Every seat was taken. Watching our fellow passengers climb aboard, it was clear that most folks were headed up to walk in the Sunshine Meadows area, which last year was rated the #1 hike in Canada by Lonely Planet. The trails here are relatively flat and incorporate 4 viewpoints, a few lakes and LOTS of wildflowers. The trail network comprises somewhere around 10 – 11 km, with several options for shorter walks. 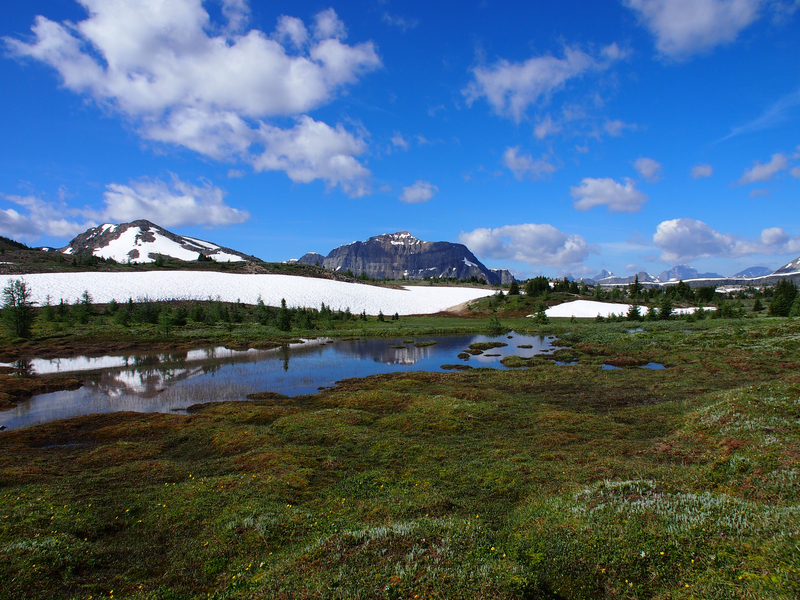 Exploring this area would be a great option for those with limited hiking experience, equipped with running shoes and a water bottle (and bear spray), or for those with limited endurance. 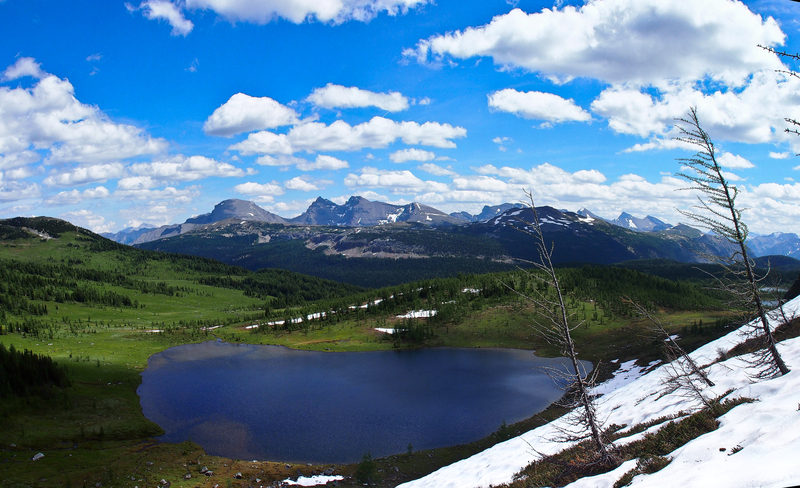 The longer hiking/backpacking options are to Mount Assiniboine via Citadel Pass (August 2009) or to Healy Pass / Egypt Lake via Simpson Pass. 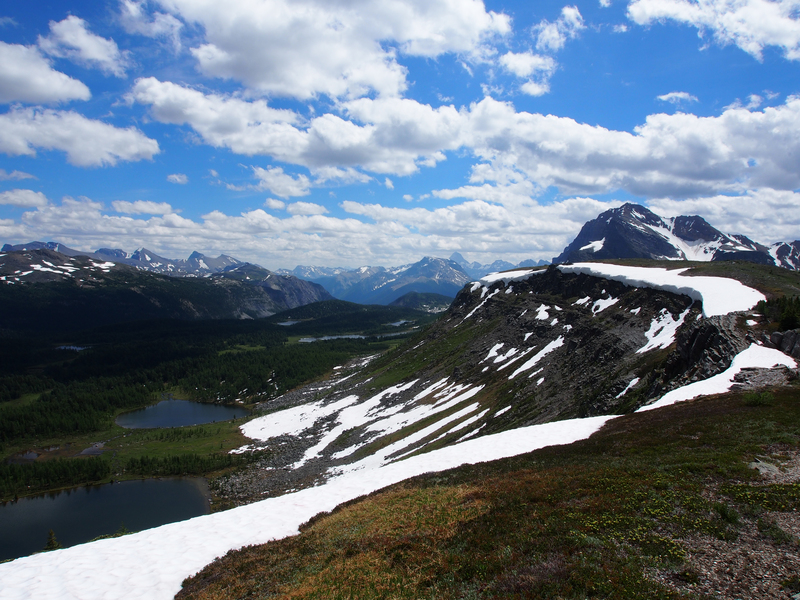 Our route via Simpson Pass started with a gentle climb towards Monarch Viewpoint. Numerous creek banks crowded with wildflowers provided a colourful start to the day. 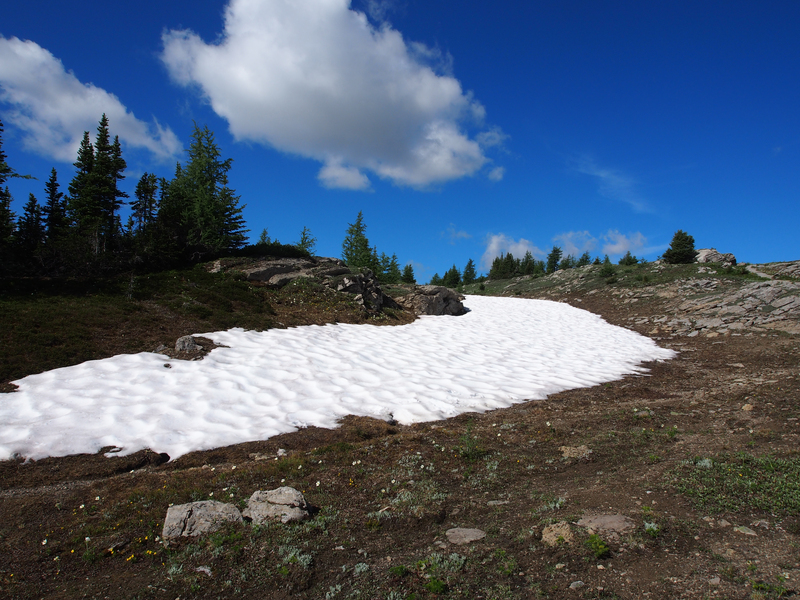 After gaining a little elevation, we came across several large patches of snow just off the trail, but the trail itself was in good condition all the way to Monarch Viewpoint. Past Monarch Viewpoint, we lost a bit of elevation before the trail opened onto a small meadow with an amazing view of our objective – Healy Pass. Once we circled the meadow and entered the trees, views were limited for well over an hour. 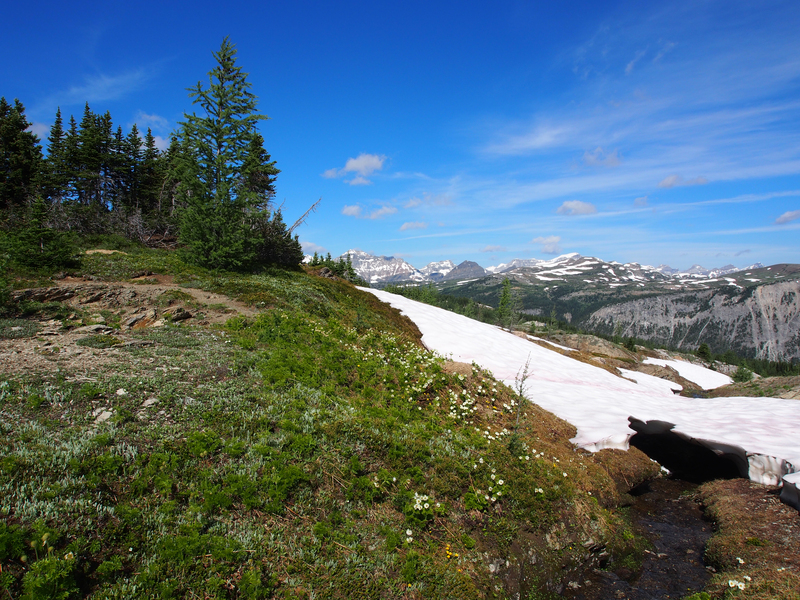 The forest seemed to go on and on, offering a few isolated glimpses of peaks to the north, rock falls to the south (with a sunning marmot or two) and lots of glacier lilies on the forest floor. The GeoKids pulled well ahead as we trudged through the forest, batting at mosquitoes. They sat down to rest at the “big rock” atop Healy Pass about a half hour before Mr. and Mrs. GeoK did. Once out of the forest and moving along the meadow trail connecting Simpson Pass to the Healy Pass trail, they spotted a young bull elk. At the “big rock” they spoke with several other hikers and heard reports that a black bear had been spotted in the area that morning. 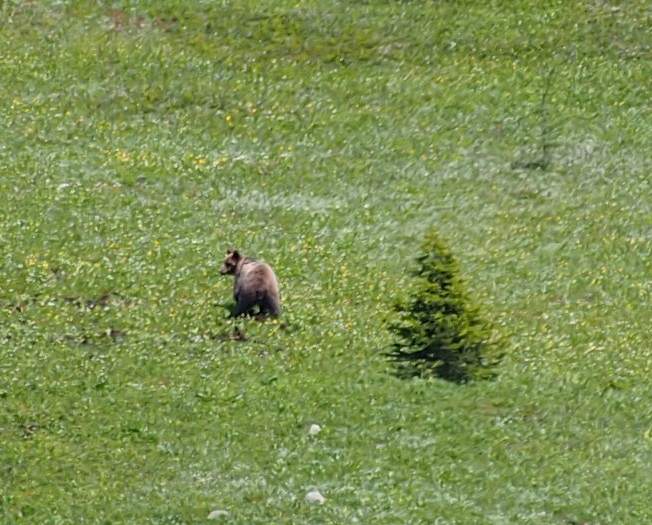 A grizzly was just down the hill digging up glacier lilies. The boys radioed back to let us know we should be making lots of noise as we approached the summit, so we regularly called out as we moved quickly to rejoin them. With a grizzly in the area, we quickly ate lunch and decided to hike a short distance along Monarch Ramparts to see if we could spot the bear before beginning our descent. We stuck together for about a kilometer and a half and then Mrs. GeoK and K found a comfortable rock and pulled out the spotting scope and big telephoto lens to scout for the grizzly. After about 5 minutes, Mrs. GeoK spotted the grazing bear, about a kilometer away. 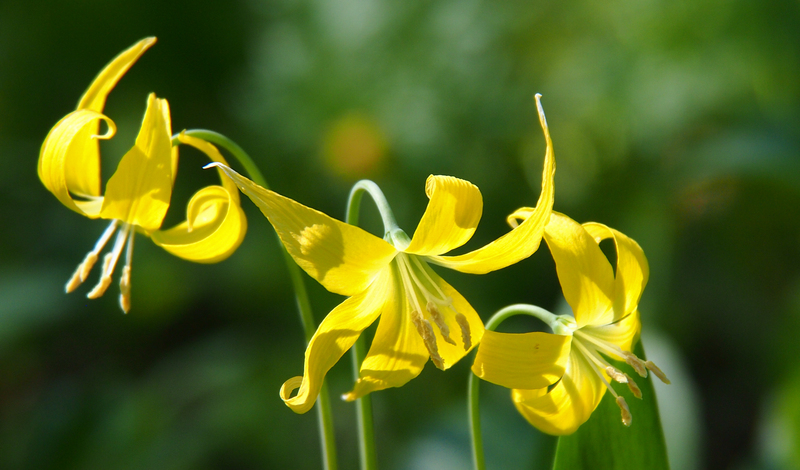 It was busy digging up more glacier lilies and very close to the trail. Meanwhile, Mr. GeoK and C headed further up and along Monarch Ramparts to take some amazing photos. When we hike out this way again, we’ll plan an earlier start so we can hike a little further along this very scenic ridge. A group of six hikers were ready to descend from Healy Pass just as we returned from our exploration of Monarch Ramparts, so we teamed up with them, figuring a group of 10 would make more than enough noise. Once we reached the meadow where the Simpson Pass and Healy Creek trails intersect, we thanked them for providing safety in numbers and then picked up the pace as we headed down the Healy Creek trail. It was a long trudge back on a hot afternoon, but a wide variety wildflowers provided much-needed distraction. We finally made it back to the parking lot about 4:30. For Mr. GeoK and C, total hiking distance was about 23 km with 550 m total elevation gain (about 325 m net). Driving back towards the east gate of Banff National Park, we all agreed we liked the first couple km of the Simpson Pass route, as well as the last part through the meadows before the final ascent to Healy Pass (although this section was quite muddy). The middle section – the prolonged march through the forest – was pretty unappealing, but no more so than the climb through the forest via the Healy Creek route, so choice of route for any return visit would probably depend on the availability of seats on the shuttle bus. We’d recommend this one for experienced hikers comfortable covering 20 – 25 km in a day, especially anyone who enjoys spotting wildflowers and “big” views. Although our bus driver reported that no bears had been spotted in the area as of the day before, we saw a grizzly and other hikers told us of a black bear in the area. 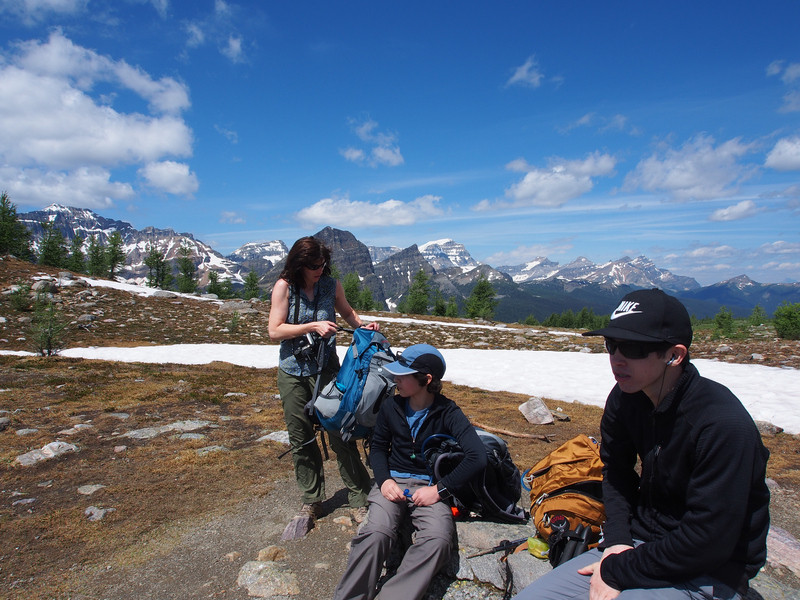 So be sure your hiking pack includes bear spray (and that you know how to use it) and follow the usual safety measures when venturing out into the Canadian Rockies. 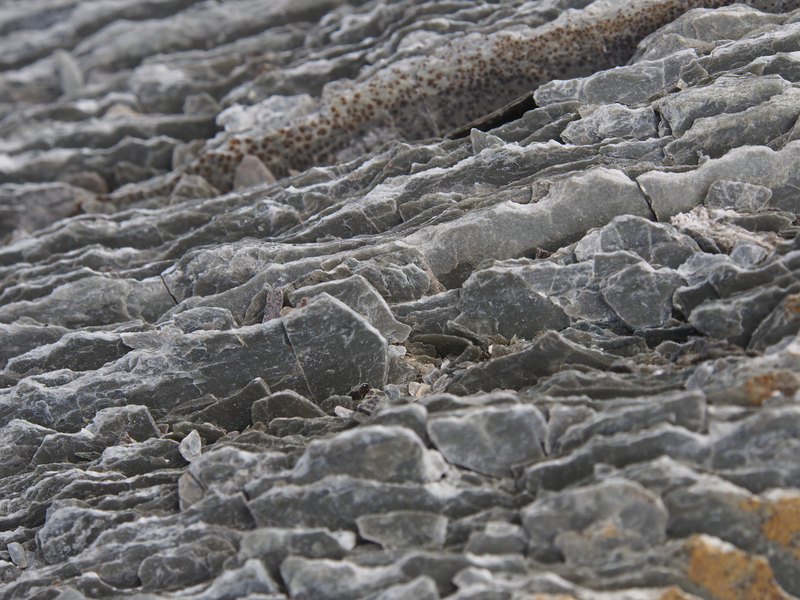 Trail conditions are regularly reported by Parks Canada and a weekly Bear Sightings report can be viewed here.